In posts over the past eighteen months, we’ve noted the progress in the construction of St. Paul’s new home on Hackett Boulevard, beginning with the groundbreaking in July 1964, following the stages of construction through 1965 and early 1966, and most recently the consecration of the high altar and the laying of the cornerstone. Today we celebrate the fiftieth anniversary of the building’s consecration on June 4, 1966. The new edifice replaces the former church in the South Mall. Following the prayer of consecration, Bishop Brown made a circuit of the church, praying at the font, the crossing, the midst, the pulpit, the crossing again, and the sanctuary. In the next photographs, we see the bishop at two of these stations. The first photo shows Bishop Brown, with Father Parke holding the service book. In the background is St. Paul’s rector, J. Raymond McWilliam; the server with his back to the camera is Peter Eells. The second photo shows Bishop Brown and Father Parke, with the same two servers. After the circuit of the church, the Sentence of Consecration was read by George A. Taylor, St. Paul’s rector from 1932 until 1948. Following the celebration of the eucharist, the bishop preceded by Father McWilliam processed from the church as the congregation sang Vigiles et Sancti (“Ye watchers and ye holy ones”). The reception after the service was the first to be held in the church hall, now known as McEwan Hall, in honor of William Starr McEwan, treasurer of the building committee. We see McEwan standing that day in the narthex with the building’s architect, Donald Stephens. Finally, here are two photographs of clergy taken in the parking lot, probably immediately after the service. This entry was posted in Clergy, Construction, Hackett Blvd Building on May 31, 2016 by Paul Nance. Yes, here is your formal invitation, to the consecration of St. Paul’s new Hackett Boulevard building on June 4, 1966. As we have seen, the nave had been in use since April 7, but work on the chapel and Sunday School rooms would continue into the summer. As we prepare to note the fiftieth anniversary of the building’s consecration, it is interesting to look back at what was being said about the new building when it was new. We don’t have records of discussions within the St. Paul’s family about the design of the new church, but we do have two slides of an architect’s model that was shown to the congregation before construction began. We also have newspaper reports of the design, with some interesting details on how and why it was chosen. Outside, the church gives the impression of slenderness and height, with a white bell tower in the forms of an abstract cross soaring skyward…. Inside, the nave is designed to focus everything on the plain, marble free-standing altar. The sawtooth construction of the side walls, patterned after the new cathedral in Coventry, England, helps create this focus. The zigzag causes the light from the narrow stained glass windows to be reflected on the gray, rough-textured bricks that make up the walls. Because of the construction, a member of the congregation facing the altar cannot see the stained glass windows, which, according to Father McWilliams, minimized distractions and keep attention focused on the altar. The comparison to the window design to that of Coventry Cathedral is one that is often still made. What has been forgotten over the years is the building committee’s survey of new church in New York and New England. It would be interesting to know where they visited. We know of one for certain, because an April 2, 1966 Times Union article specifically mentions it. 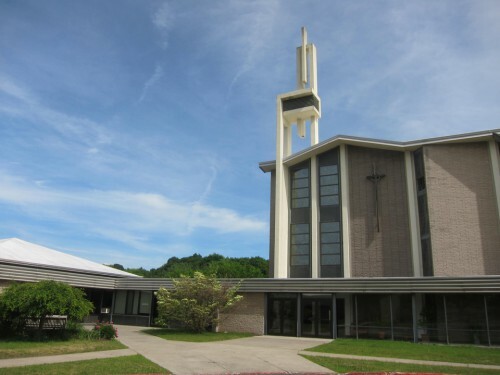 The congregation drew inspiration from a similar project in the Church of Saint Mark in New Canaan, Conn., with adaptations executed by St. Paul’s architect, Donald J. Stephens of Loudonville. While the exterior of St. Mark’s Church is certainly reminiscent of St. Paul’s (if a bit more elaborate), the interior is even more so, with its free-standing altar and an elaborate reredos screening the choir and organ from the rest of the nave. Both of these articles also explain how carefully the building committee attempted to incorporate elements of the old building into the new. Prominently mentioned are the ten J. and R. Lamb windows in the narthex, the Tiffany Good Shepherd window in the sacristy and the almost complete preservation of elements in the chapel. “Christ the Good Shepherd” was given in 1899 in memory of J. Livingston Reese, rector of St. Paul’s from 1864 until 1891. It was designed and executed by the Tiffany Studios, after a painting by Bernhard Plockhorst. This entry was posted in Hackett Blvd Building on May 13, 2016 by Paul Nance. Today’s post brings a story from the memoirs of Arthur R. McKinstry (St. Paul’s rector from 1927 until 1931), with an amusing anecdote about Eleanor Roosevelt’s preference for simple food during Franklin’s term as New York governor (1929-1932). Albany society, which had felt particularly cheated during the Smith regime, rejoiced that aristocracy had returned to the Governor’s Mansion. They waited hopefully for the first high tea to be given by Mrs. Roosevelt. But Mrs. Roosevelt, not sensing this, and being interested in a school and a furniture factory in New York City would be absent from Albany virtually the whole week, returning only for the weekends. Soon Albany society became very discouraged about the prospects of any activity in the Mansion House. A good friend went to Mrs. Roosevelt and explained the situation to her, whereupon the Governor’s wife sent out engraved invitations, with one going to the rector of St. Paul’s Church and his wife. We all gathered expectantly at the Mansion. I remember how Mr. Roosevelt, came in – how gracefully he moved among the guests on his crutches. But what almost ruined relations between the Mansion and the society of Albany was the fact that on that occasion Mrs. Roosevelt served only bouillon cubes and saltine crackers. Albany society felt cheated again. Albany society need not have been surprised that the new governor’s wife would have little time for entertaining. Mrs. Roosevelt had announced before Franklin’s inauguration that she would be busy from Tuesday through Friday each week, teaching American history, literature and serving as Vice-Principal at the Todhunter School for Girls in New York City, and overseeing the furniture factory at Val-kill in Westchester County. Albany society’s values were shallow indeed: despite the warmth of the Roosevelts’ greeting, they thought the event “almost ruined” because of the simplicity of the refreshments. No disrespect was intended: the food served was a matter of principle for Eleanor Roosevelt. Starting during the early 1920’s, Eleanor was much influenced by the Cornell University Home Economics program. She had a close relationship with its founders, Martha Van Rensselaer and Flora Rose, and advocated their simple and frugal recipes. While commentators agree that the Cornell program influenced Eleanor Roosevelt, there are two related theories about underlying factors, the type and quality of food served during the White House years. As a practical matter, Henrietta Nesbitt, the head housekeeper that Eleanor employed during the entire time she lived in the White House, was unprepared for her role as supervisor of a staff of thirty-two, both maintaining the mansion and organizing meals from state dinners to family suppers. She seems also to have been willfully incompetent, ignoring advice from professional chefs and restaurants. Roosevelt’s biographer, Blanche Wiesen Cook, in a chapter titled “ER’s Revenge: Henrietta Nesbitt, Head Housekeeper” argues that Eleanor Roosevelt’s hiring of Nesbitt and her refusal, despite many provocations on Nesbitt’s part, to dismiss her, is an element in the First Lady’s passive-aggressive style in a troubled marriage. In partial defense of Mrs. Nesbitt, Barbara Haber points out that Nesbitt was above all loyal to her employer and benefactor, and was carrying out Mrs. Roosevelt’s instructions. This psychologizing on party food, however, seems petty and even mean-spirited. Eleanor Roosevelt, as First Lady of New York State, then as First Lady of the nation, and finally (in Harry S. Truman’s phrase) as First Lady of the World, lived a busy and noteworthy life, contributing much to our nation and our world. As a woman with many interests and causes, as her husband’s legs during Franklin’s governorship, as one of the most active and effective First Ladies in our history, Eleanor Roosevelt had far more important things on her mind than canapés. Returning to St. Paul’s connection to this story, our rector Arthur R. McKinstry wrote that Governor Roosevelt knew him “quite well” when they were both in Albany, and we suspect this was not the only time McKinstry visited the Governor’s Mansion. Roosevelt and McKinstry kept in touch after Roosevelt was elected president, and in 1935 Roosevelt pressed his church, St. Thomas, Du Pont Circle, Washington, D.C. to call McKinstry as rector, a call that he declined. McKinstry went on to be named bishop of Delaware. Arthur McKinstry, All I Remember…: The McKinstry Memoirs by the Fifth Bishop of Delaware 1939 – 1954 (Wilmington: Serendipity Press, 1975), 40. “Mrs. Roosevelt to Keep on Filling Many Jobs Besides Being the ‘First Lady’ at Albany,” New York Times, 10 Jan 1928. H. Roger Segelken, “Affectionately, Eleanor,” New York Archives 15, no. 4 (Spring 2016), 12 – 17. Laura Shapiro, “The First Kitchen: Eleanor Roosevelt’s austerity drive,” New Yorker (November 22, 2010). Henrietta Nesbitt, White House Diary (Garden City: Country Life Press, 1948), 185. Barbara Haber, “Home Cooking in the FDR White House: the Indomitable Mrs. Nesbitt,” in From Hardtack to Homefries: An Uncommon History of American Cooks and Meals (New York: The Free Press, 2002), 118-119. Blanche Wiesen Cook, Eleanor Roosevelt, Volume 2, 1933 – 1938, (New York: Viking, 1999), 52-59. This entry was posted in Uncategorized on May 6, 2016 by Paul Nance.